AZ Precision, Author at AZ Precision Ltd.
Hello again! This time we would like to introduce you to the way dry carpet cleaning works. Let’s say that some of the fabrics in the world do not like water thus making them a bit more difficult to clean than others. They simply need a special attention. You may have heard about natural fibre flooring or you may already have one in your home. We are talking about natural fibres such as jute, coir, seagrass, and sisal. 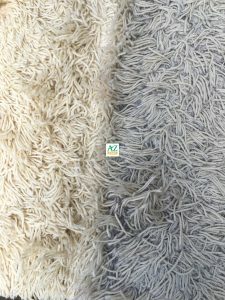 With natural flooring, we only recommend dry carpet cleaning method as any hot water extraction method will damage it and will cause colour loss. 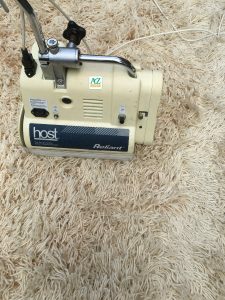 We use the Host Dry Extraction Cleaning System with environmentally friendly Host granules sprinkled over your carpets. We always pre-vacuum the area first using powerful equipment, because most of the dirt in your carpets is just dry dirt. Next, we apply the granules, then we brush with the Host machine in different directions. The dry cleaner dissolves the dirt and then absorbs it without leaving a sticky residue. The last stage of the process is to vacuum again to remove the dry cleaner. It is possible some traces of the dry cleaner to be left in the carpets. Rest assured, they are not harmful and will go away after a few times vacuuming. As there is no water involved in this method, there is no danger of shrinkage or bad odours. The carpets are left clean and deodorised. Need any dry carpet cleaning in London? We are here to help, please, email [email protected] or call us on 0207 476 0511. You may be looking to simply improve your home for you and your family, or you may be in the process of selling your home. Certainly, a well-maintained wood flooring can be an eye-catching centrepiece to your home and could be just the thing a prospective buyer is looking for to make their own key decision. 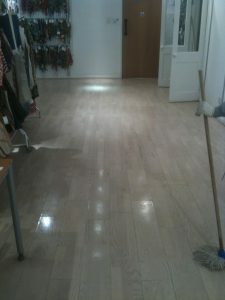 Deep wood floor cleaning and resealing protects the surface and ensures your wood floor remains in perfect condition. 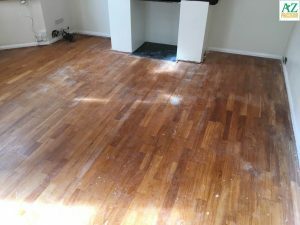 With time and in high traffic areas the surface protection will eventually wear off and may require complete wood floor restoration by sanding and sealing. 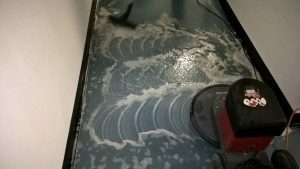 At AZ Precision, professional floor cleaning contractors, our services include floor polish stripping and removal of surface coatings, mechanical deep cleaning and floor restoration with application of sealers, polishes or oil. 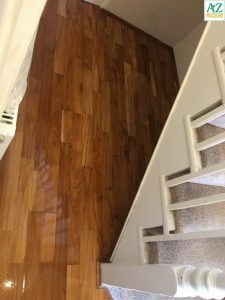 Engineered wood flooring is a popular choice in many properties across London. It is relatively easy to maintain from new. After some time, it will require refreshing to maintain the quality of the wood and ensure the appearance remains pleasing to the eye. 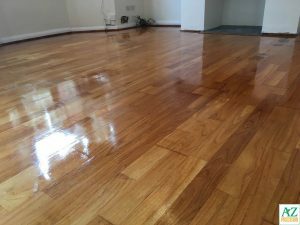 We recommend deep cleaning by rotary machine to remove the accumulated surface soiling and then applying polish to protect and enhance the appearance of the wooden floor. A regular wood floor maintenance can save you money. Christmas is coming and it is time for giving presents. Therefore, give your home the present of love and care, and professionalism from AZ Precision. It is the first day of winter and we all hope you have plenty of cosy moments to look forward to this season. Think about the investment you have made in all your valuable rugs, carpets, curtains, and upholstery and grab the special offer in our Winter sale – 10% off our carpet and upholstery services throughout December and January. If you book carpet and/or upholstery cleaning, before 31st Jan 2017, for £100 or more, you automatically get 20% off your next booking. Christmas is also a time for sharing with family and friends so make sure your home is looking as sparkling as the bubbles on your Christmas tree. Don’t delay, call us today! Finally, forget about the traffic jam, the train strikes, the plane delays, and the worries about the Christmas shopping and let us help you, so you come back to a nice and clean home. We wish you, all our readers and customers, a wonderful Christmas and a Happy New Year! 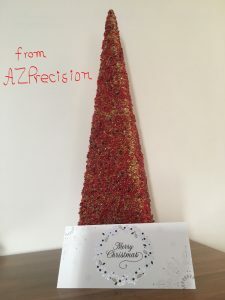 From all of us at AZ Precision. Over the many years, we were doing business we had tried different brands and models of carpet cleaning machines, big names as Prochem and Karcher. They all had their advantages and disadvantages. Recently we discovered Powr-Flite and we were amazed by the results it could achieve. Therefore, we decided to share our thoughts on the subject and let you know more about this carpet cleaning monster. 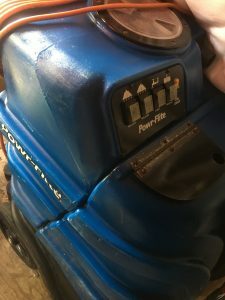 Powr-Flite PFX1085 Extractor – the super charged portable extractor with more power than any other system currently available in the market today! The Powr-Flite has a powerful pump delivering adjustable pressures of up to 500 psi. That is enough to clean the dirtiest carpets. The Powr-Flite also features an in-built 3000W heat exchanger delivering the hottest water temperature available in the portable machines. The powerful electric heater produces very hot water that is maintained throughout the cleaning process. Dirt does not stand a chance! With the Powr-Flite you get maximum power for super clean carpets that dry fast. The 6.6” Lamb Ametek vacuum motor provides the recovery power to get the job done. Sound suppression system keeps noise at a minimum for operator comfort and safety. Twin Jet Wonder Wand – The easy to use Wonder Wand glides effortlessly across all types of carpet, dramatically reducing operator fatigue. The unique roller system allows you to roll the wand forward and back without lifting it. With Wonder Wand you work faster with significantly less effort, you get more work done in less time. The Wonder Wand’s patented technology never lets the solution come to rest on the carpet. This “solution control” process allows more solution to be pushed through the carpet fibres without soaking the backing and pad. Solution is recovered instantaneously. As a result, carpets dry much faster. The Wonder Wand recovers as much as 50% more solution than conventional wands. 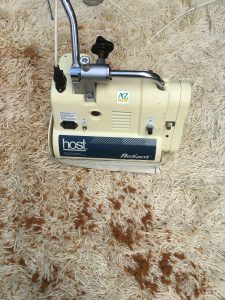 All of these amazing features are what make this a really professional carpet cleaning machine used widely in the carpet cleaning business. We use it for all of our carpet and upholstery cleaning services guaranteeing happy customers. Barking, Barnet, Bexley, Brent, Bromley, Camden, Central London, Croydon, Ealing, Enfield, Greater London, Greenwich, Hackney, Hammersmith, Haringey, Harrow, Havering, Hillingdon, Hounslow, Islington, Kensington & Chelsea, Kingston Upon Thames, Lambeth, Lewisham, Merton, Newham, Redbridge, Richmond Upon Thames, Southwark, Sutton, Tower Hamlets,Waltham Forest, Wandsworth, Westminster, Wimbeldon. Hope you found the above useful! Want to learn about carpet soiling? Here at AZ Precision we love learning about carpets. So we felt we would share some thoughts with you. 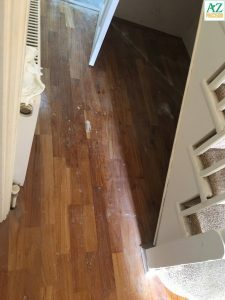 Whatever the environment, carpets and hard floors are affected by both contact and airborne soiling. Soiling cannot always be identified easily, and with pile material like carpet, hidden soiling can be much greater than the visible soil. We identify different types of soiling in our everyday life like sticky materials, stains, wet soil, dry solids etc. Stains represent a small portion of soiling, but can be highly coloured so that carpets become dyed and soiled. Stains should be dealt with as quickly as possible. Dry soil can normally be removed by vacuum cleaning. Extreme vacuuming can sometimes bring back the most soiled of carpets. In fact, carpets cannot be over vacuumed, but not vacuuming enough is one of the biggest mistakes people can make. If you cannot replace your old carpets, the absolute best method is to start with vacuuming. Most of the times, when the vacuuming programme has been so poor over the years, and you have got so much dry soil built up into the carpet, when you introduce water to try to extract it, you just get mud. In such cases, once accomplishing the extraction of the dry soil embedded deep in the fibres, you can start pre-spaying, deep agitation with an alkaline cleaner and extraction with clean water is recommended. Sticki materials containing oil, grease or other sticky substances which are difficult to remove, require professional cleaning. 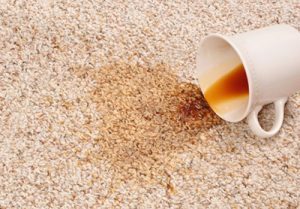 Spill can ruin your beautiful carpet in seconds. Don’t panic! 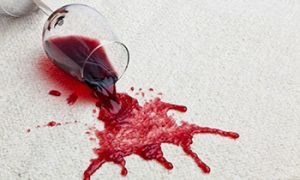 If you spilled red wine, for example, absorb the liquid with clean dry cloth or plain white paper towels and while the red wine is still wet, pour some white wine on it to dilute the colour. Then clean the spot with cold water, sprinkle the area with salt and wait about ten minutes. Finally vacuum the whole mess. Islington Kensington & Chelsea Kingston, Upon Thames, Lambeth, Lewisham, Merton, Newham, Redbridge, Richmond, Upon Thames, Southwark, Sutton, Tower Hamlets, Waltham Forest, Wandsworth, Westminster, Wimbeldon.